As part of Hackensack Meridian Health’s ongoing mission to advance medicine, the new HOPE Tower at Jersey Shore University Medical Center features outpatient services with leading experts in more than 15 specialties, an academic and research center to teach and pioneer lifesaving medical breakthroughs and a state-of-the-art cancer center with sophisticated technology. It’s just one more way we are well-orchestrating the best patient experience. 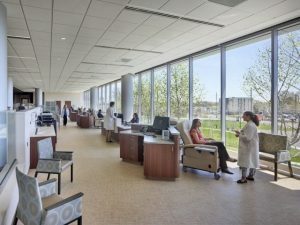 The warm and welcoming design of HOPE Tower’s new cancer center offers patients the latest in technology and treatment options, including dedicated areas for infusion, radiation therapy, counseling and supportive care – all in one convenient location. This encourages collaboration and a multidisciplinary approach among physicians, nurses and other clinicians. And with diagnostic imaging, laboratory and pharmacy services within the tower, there is easy access for required testing. Physicians and their patients also have access to collaborative research and participation in the latest clinical trials. Learn more about Jersey Shore University Medical Center’s comprehensive cancer program. 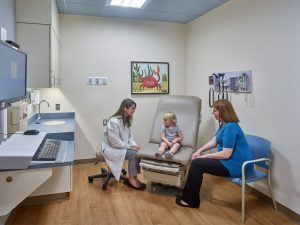 HOPE Tower brings together a wide range of pediatric and adult medical expertise that spans several floors of the facility. Guests visiting the pediatric floor are welcomed by cheerful colors, fun art, and child-size seating and tables in the waiting area to lift the spirit and reduce anxiety. Pediatric sub-specialists provide diagnosis and treatment in the areas of gastroenterology, endocrinology, pulmonology, infectious disease, neurology and hematology/oncology, with room to add more sub-specialties in the future. Physicians caring for adults occupy several floors in the tower, with expertise in the areas of internal medicine, psychiatry and behavioral health, infectious disease, rheumatology, endocrinology, uro-gynecology, obstetrics and gynecology, maternal/fetal medicine, and surgery. HOPE Tower is home to the Christopher Center for Mental Health & Wellness. 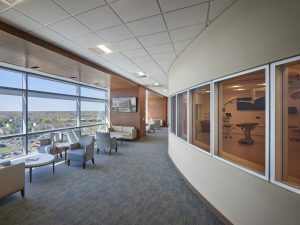 With eleven faculty offices, examination rooms, a welcoming reception area and comfortable waiting area, patients will receive behavioral and mental health care in a beautiful and dignified setting. The creation of this space within the tower demonstrates the medical center’s commitment to developing a strong, responsive and strategically aligned group of outpatient services to meet all aspects of physical, mental and emotional wellness. Patient convenience is a core element of the HOPE Tower. Individuals requiring imaging services, lab work, or pre-admission testing can find all services in one centralized location on the first floor, easily accessible from the attached parking garage or by using free valet parking. Services such as blood work, EKG, and imaging tests (MRI, CT, X-Ray, ultrasound, bone density and nuclear medicine services) are offered six days a week with convenient hours. Jersey Shore University Medical Center is the region’s only academic university-level teaching center, and HOPE Tower serves as home to medical education programs and research services. HOPE Tower houses team members involved in research and clinical trials, and supports patients who are involved in trials with modern offices and high-tech exam rooms for treatment and evaluation. With a vision to cultivate an organizational environment that is dedicated to interdisciplinary, professional, patient-centered education, HOPE Tower features a high-tech simulation laboratory. The lab fosters experiential and simulation-based learning with an emphasis on patient safety, quality, innovation and patient interaction. In the 6,500+ square foot, state-of-the-art innovative simulation laboratory, interdisciplinary teams learn in a team-based environment. Medical residents gain training for various high-risk scenarios, allowing for real-time exposure to high acuity incidents in a controlled environment. Nurses and allied health professionals also partake in scenarios. The integration of simulation-based and experiential learning into interdisciplinary education programs builds upon Hackensack Meridian Health’s continued commitment to leadership in health care education. The John K. Lloyd Amphitheater is a key feature of HOPE Tower’s new conference center. It is a 200-seat theater-style auditorium featuring the latest audio visual technology with the ability to stream live broadcasts and record sessions. 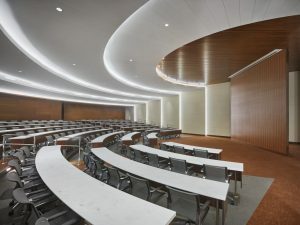 The amphitheater provides a state-of-the-art meeting space to host a variety of educational, clinical and community events. Cancer Center (Perricone Center for Women’s Cancer), TrueBeam linear accelerator for radiation therapy, cardio-oncology program), imaging services, preadmission testing, and café. Floor 10: Conference Center, 200-seat Amphitheater, Rooftop Terrace.